What is the Martinson Child Development Center (MCDC)? MCDC provides quality child care and other family support services for 70 children, ages 30 months though 11, five days a week. It was founded in 1969 in Alviso to provide these services to low-income families who otherwise would be unable to care for their children while working. What does low-income mean specifically? At MCDC, 60% of our families meet California's low-income guidelines and pay no fees. Most of the rest pay reduced rates based on their income and family fee schedule. Please see the home page for the full rate. How does the state subsidize child care payments? Each year, the state determines a daily reimbursement rate and then pays MCDC a fixed amount for a minimum number of days of subsidized care for qualified families. For the past year the state required 5700 child-days of care (1 year of care for 23 children). MCDC actually provided over 8000 child-days. Groups like United Way and Rotary provide annual grants that help pay for the additional un-reimbursed care. Don't families have lots of choices for a center like this? Other centers in the area are more expensive and do not provide subsidized care for more than a few children. Also, about half of the families at MCDC do not own a car, meaning they live or work nearby and use public transportation. The community need is great and the goal of MCDC is to accept as many children as possible. For many of these families, MCDC is one of the most stable factors in their lives. What is the center raising the money for? Is this an annual campaign? This is an once-in-a-lifetime campaign to purchase the land and building the center currently occupies. The center was flooded out of Alviso in the 1980's and then in the 1990's lost a facility on the Agnews grounds when the state sold the land to Sun Microsystems. At the end of this 2-year campaign we will have a permanent home in Santa Clara and will be financially self-sufficient. Isn't this an expensive facility? Rivermark, the developer of the homes and retail space surrounding the center, has agreed to donate $1M to pay for the land we are on. MCDC will not receive this money if we move elsewhere. The Rivermark donation means that we need to raise only $1.5M for a permanent home in a building specifically designed for child care (with uncommon requirements like lots of tiny potties in the restrooms). Are my donations tax deductible? How do I donate? 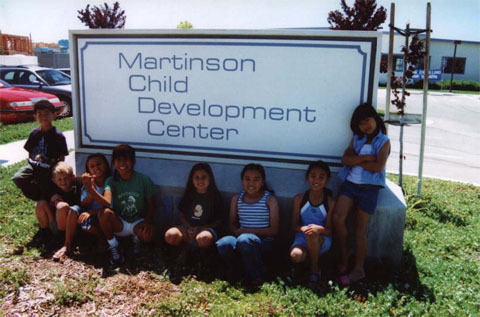 The Martinson Child Development Center is a 501(c)(3), 50% charitable organization. Our FEIN is 94-1709391. Please contact the Director, Rosie Limos, at (408) 988-8296. We are in the process of adding more information at http://www.martinsoncdc.org.